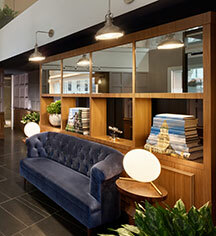 Discover the rich history and modern conveniences of the Ames Boston Hotel, Curio Collection by Hilton. Originally built in 1893 and added to the National Register of Historic Places in 1974, the Ames Building is considered Boston’s first skyscraper and remains a vital part of its history. The hotel is located across the street from the Freedom Trail, the Boston Old State House, and One Boston Place. Guests will be within walking distance of iconic Boston attractions, including Faneuil Hall, Quincy Market, Boston Common, and the Boston Waterfront. The Back Bay Area, Fenway Park, the Shops at Prudential Center, Copley Square, Newbury Street, and Boston Logan Airport are all just a short drive away. Experience why the Ames Boston Hotel has been proudly placed on Conde Nast’s Gold List 2017 and flagged as Massachusetts’s first Curio, A Collection by Hilton. Boston’s maximum height restriction of 125 feet was established three years after the 196 foot tall Ames Building was completed and it was the tallest masonry building in the United States at the time. Check-in time: 3:00 p.m to 12:00 a.m.
Adjoining Rooms: Yes, however, not traditional connecting rooms. The rooms we label as connecting do so through an outside door which will shut and the two adjacent room doors will be propped open and connected by a small private hallway. Room keys will access the exterior hallway door. Contact Ames Boston Hotel directly to ensure if these are the accommodations you desire; our team can ensure you are blocked in one of these specific sets. Airport Transportation: No, however, taxis are readily available at the airport and the average cost from Boston’s Logan Airport (BOS) to the hotel is approximately $25-$35. Other options, such as Uber and Lyft are available as well. An app on your mobile device or tablet is needed for these services. Their Concierge can assist with a car service and can be contacted through email or by dialing 617-979-8100. Cancellation Policy: If booked directly through the Hotel, they have a 24 Hour prior to arrival cancellation policy on most reservations. You must cancel by 3pm Eastern Standard Time the day prior to arrival to avoid a penalty. On certain reservations a special cancellation may apply. If booked through a third party or online service, you may be subject to different cancellation policies. Cribs and Pack-in-Plays: Available; complimentary. Parking: Yes, valet parking is available for an additional $50 per night with unlimited in and out privileges. Other parking facilities with pricing similar to theirs are nearby, but do not offer unlimited in and out privileges. Payment: A valid credit card is required to check in to the hotel, but guests may use cash or credit card at checkout to settle their bill. Pet Policy: The hotel does allow pet guests to stay at Ames Boston. Please contact their Concierge Desk at 617-979-8100 for pet supplies needed during your stay. The hotel does require pets to be kept on a leash while enjoying the property and crated in the room if they will be unattended. There is a $50 per night pet fee. Please view the hotel's entire pet policy and inform them of your additional guest so that they may make appropriate accommodations to ensure an enjoyable stay for you, your pet, and all their guests. Rollaways: Available for additional fee of $30+tax charge for all rollaways. Smoking Policy: No, Boston hotels are all non-smoking. 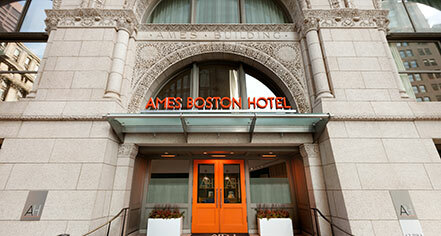 Learn more about the History of Ames Boston Hotel, Curio Collection by Hilton .